After Panzerschreck XIV last weekend, I thought I would have a bit of a debrief about using SS-Panzerbrigade Westfalen from Bridge at Remagen. Before I begin with my dissection of what did and did not work with my list, I'd like to direct you to Eric Riha's excellent theoretical analysis of the army on WWPD. His thoughts are a great place to get ideas on how to get things to work together. Also, please have a read of Sean Ireland's article, To the Bitter End, as well for even more great tips and tactics for Westfalen. I'd also like to straight away say that my recent experiences with this list are unique, which took place in an unusual setting. Bear in mind that this was a doubles event and this list was built to synergize with Andrew's Reluctant Trained Tiger IIs and PaK40s, things that are not inherently available to Westfalen in the book. So what worked for us may not yield the same results elsewhere. Like-wise I'll try and stick with tactics that work under normal gameplay situations. With that in mind, let's head west! Your job, as a commander of Westfalen, should be to totally throw off your opponent's schedule by any means necessary. It's that simple. Quickly figure out how your opponent will try and win the game and attack the tools they will use to accomplish their goal (ie artillery, breakthrough guns, etc). Don't worry about their foot soldiers or medium tanks. Pull the rug from under them and they'll topple. Using Always Defend to your advantage, execute your defender's prerogatives wisely. This often upsets plans of opponents that build their lists to defend as well. Use that confusion. Against non-German opponents, use them to ambush isolated command teams, forcing their CiC or 2iC to rush over and appoint another commander. Ambush artillery staff teams to shut down repeat bombardments and knock the wind out from under an AOP's wings (AOPs need staff teams to work). Assault immobile anti-tank guns from outside their front arc. 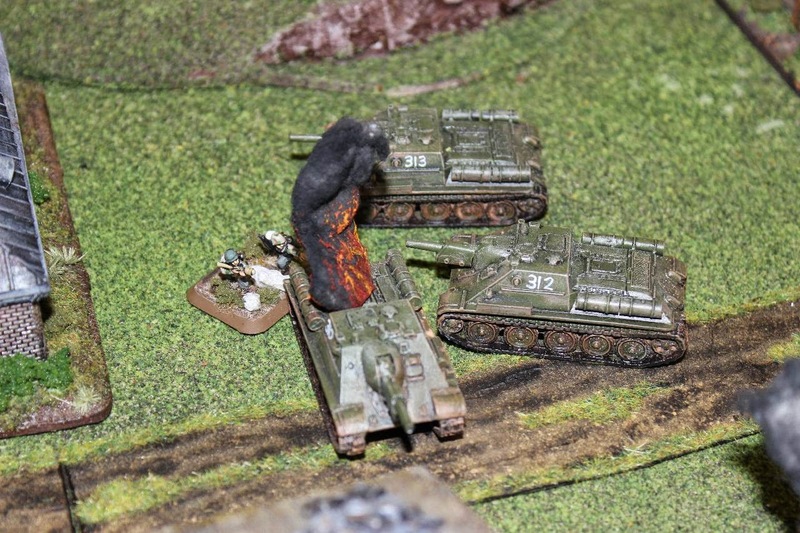 Assault and wipe out mortar platoons to reduce smoke templates. Create zones of control, forcing enemy teams around them. Kill one tank team and you've covered the cost of all four panzerfaust traps. However, expect reasonable things from them. They will not wipe out whole platoons in assaults, they cannot tackle infantry platoons directly, they cannot assault if they shoot in the shooting step, and you're Trained, which means defensive fire is going to hit you. For best results, pick your battles and carefully choose your targets. One tactic to try is a pincer attack, using two trap teams. In the example above, one trap team fired from the church steeple and hit the command tank (the only one it could reach). Another ambushed from behind, did not fire, and launched an assault from the rear, knocking out a second SU-122. The counterattack and return fire destroyed both teams in the next turn, but I had successfully eliminated two SU-122s and left the platoon leaderless outside 16"of my Westfalen infantry. 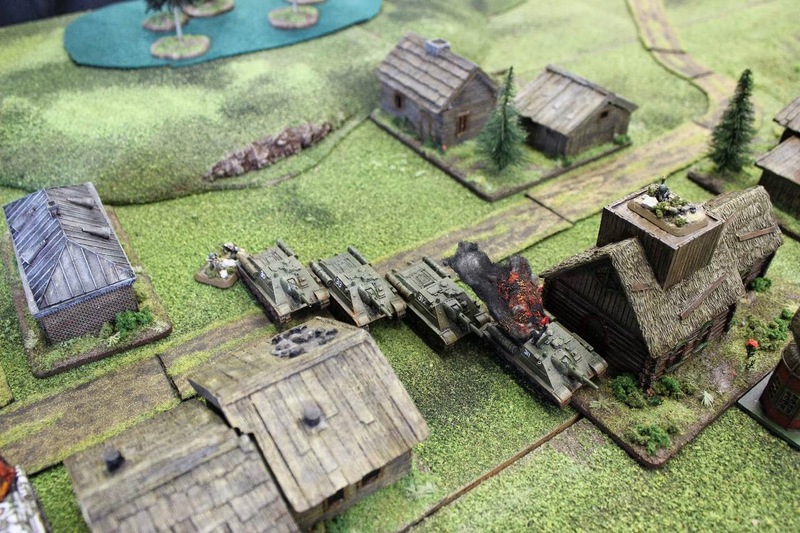 This meant that the Soviet player had to take a few turns and get his CiC forward to get the two remaining assault-guns to move up into Volley Fire range. This bought my infantry some breathing room! Backing up your traps should be some heavy tanks. You certainly have access to a lot of types! Our game used Reluctant Trained King Tigers, but as these are not available to Westfalen normally, I'd recommend some Veteran ones instead. Use them to flush enemy tanks out of the open and into your traps. Panthers, Jagdpanthers, and other heavy tanks work as well, but the KT's armor is hard to overcome (hopefully your traps have reduced the artillery threat). Under normal circumstances, snipers are a tough buy at 50 points. However, they fit in well with Westfalen's harassment policy. I bought two, but in retrospect I could probably do with either just one or go all in for three. They supplement the traps well, pinning down enemy platoons, and knocking out enemy guns with 4+ firepower. Use them together to broaden your harassment options with 5-7 irritating shots a turn. 50 points is tough to swing, but they are worth it to project firepower onto the enemy's troops. 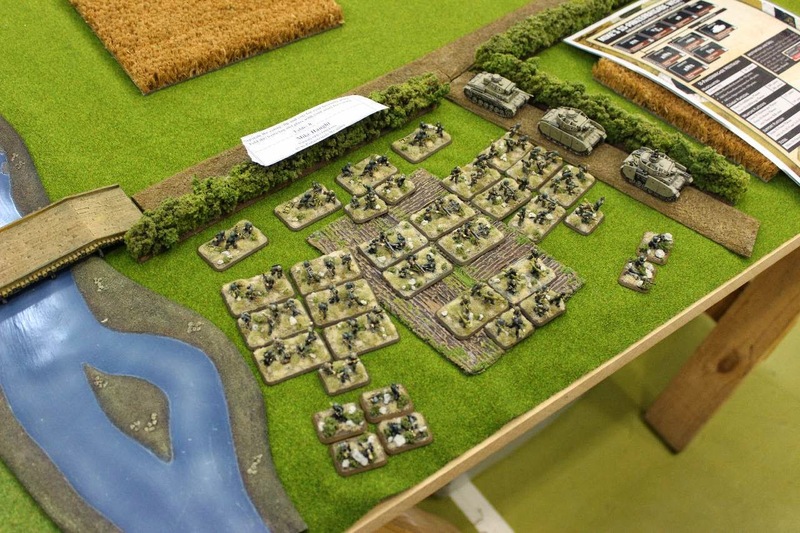 The Ersatz SS-Panzer Platoons also fit in with the Westfalen harassment objectives. 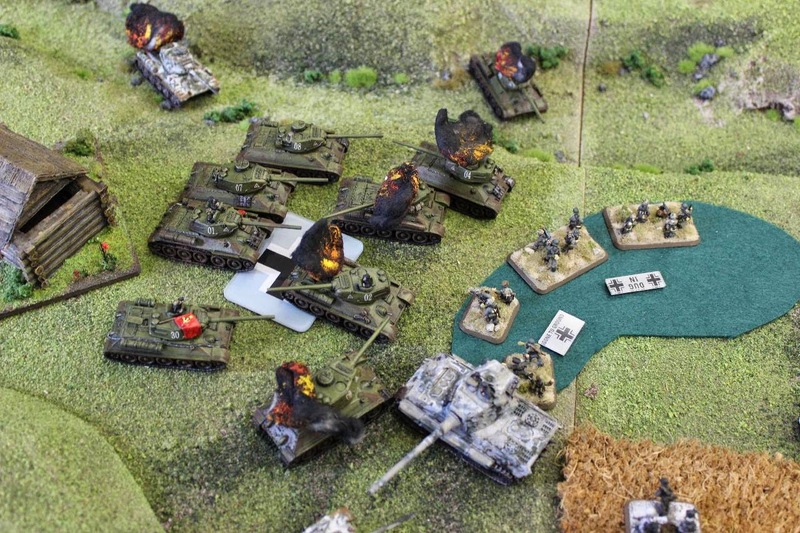 They are a good ambush platoon against infantry, or a reserve platoon for bringing out the heavy tanks first. One tip here is to focus on the Panzer IIIN model for two of the tanks. The high ROF of the L or M is attractive, but these tanks will be on the move due to their fragile armor protection. So if you're moving you're better off with a FP 3+ gun rather than a 4+ one. Having said that the ROF 3 is great for knocking out US TDs! the KT having just knocked out the one in the back. 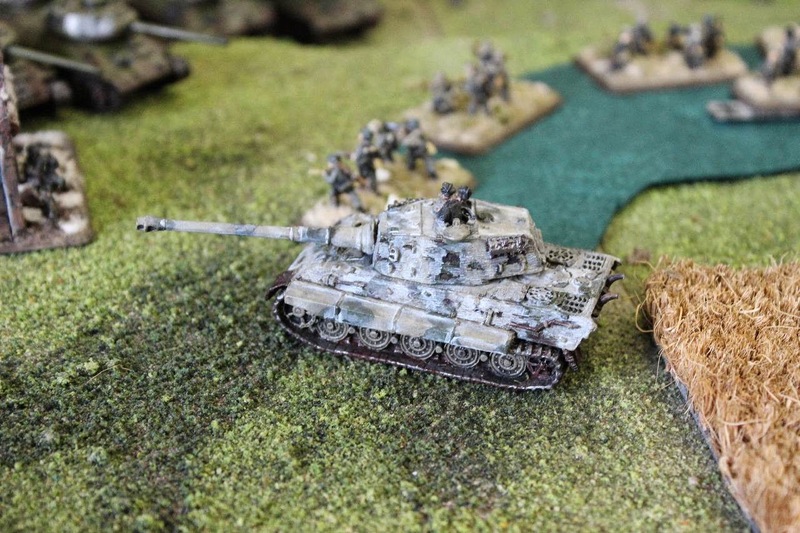 They may seem expensive, but 200 points for a tank-proof platoon is worth it. With a little Panzerfaust Trap help to remove or bog down major threats, like breakthrough guns, your infantry is more survivable. Against enemy armor I tend to place them in or a little back from difficult-going terrain features, preferably a wood if possible. Force your opponent to cross bogging terrain in order to get at you. Then let loose with your fausts. If you're in terrain like a forest or wood, your enemy will have to get really close to even shoot at them, increasing their survival. Again, its about delay. If you can make it so the enemy cannot start shooting at you for several turns, your half-way there! If they make it through your defensive fire, you're fearless and your CiC should be nearby to help with those 1s or 2s rolled to counterattack. You'll bag a few more tanks in the counterattack, which should bounce them out and hopefully forces a platoon morale check. Against infantry, your HMGs should be firing as soon as the enemy presents itself. Remember that your traps and snipers should be targeting things like smoke generators, staff teams and breakthrough guns to help weaken your opponent's ability to cover their assault. One of the best harassment tools in your force is Enjoy the War on a 2+, because your platoons will be impossible to kill completely, especially through shooting. So they'll need to assault you and clear you out to the last man. There are ways of combating this. Attach two machine-guns and a Panzerschreck to each platoon to both bolster your numbers and add firepower. If the enemy has tanks, bury the HMGs somewhere safe and hard to get at (inside a building away from enemy-facing windows or deep within woods). Remember, that Gun teams (including attached ones) don't take Last-Man-Standing checks! Remember, Enjoy the War on 2+ gives you incredible staying-power against enemy shooting, forcing them to have to assault. You have to get your opponent on a knife edge with your traps pulling from behind, and your fausted-infantry pulling from the front. Get your opponent push quickly to force a result. Hasty attacks are where mistakes happen! 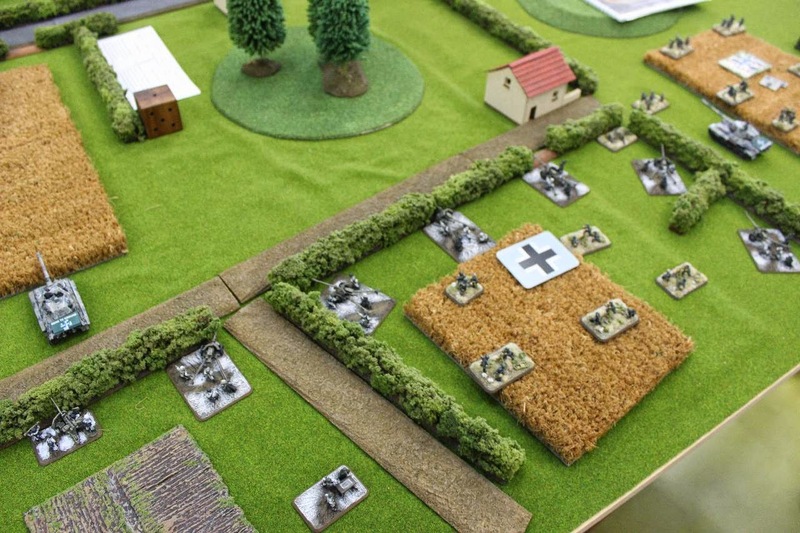 One of the interesting debates is between taking the SS-Mortar platoon or RT Nebelwerfers. For 70 points and longer range, a battery of three rocket launchers seem like a clear winner, but I hate them. Fire in the sky makes them an easy target for counter-battery fire from cheap enemy platoons, such as mortars. They'll get pinned down and as a reluctant platoon, they will be tough to get back into action. You can't even attach your CIC to help them as he's Allied to them and cannot join them. They are also a weak 4-team platoon, prime pickings for a universal carrier platoon, or a rogue mortar jeep. I believe they are likely to be idle points and a lost VP. However, others disagree and that's fine. 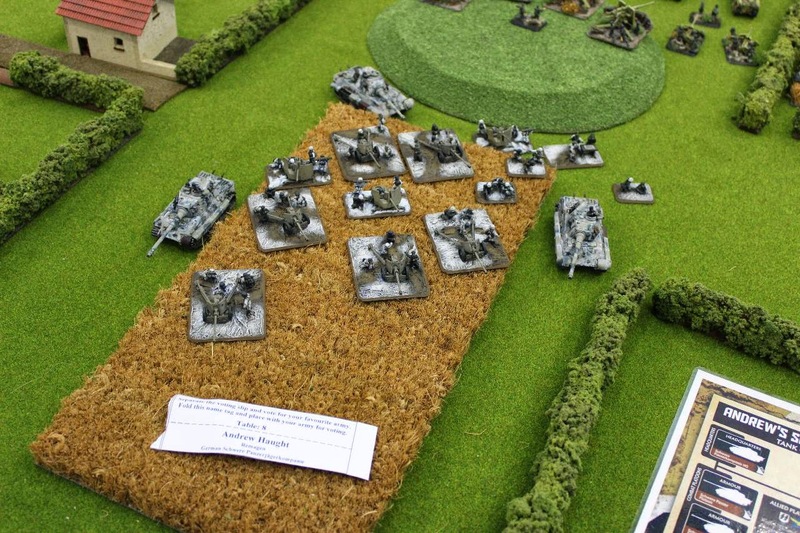 For my part I'll take the 110pt 4-tube mortar platoon (always buy the observer!). The mortars cannot be as easily "counter-batteried", and if they are, they will reliably bounce back into action the next turn. They can provide smoke as well as break up infantry assaults. Their 6+ firepower and shorter range is not so much of a problem as the enemy's infantry should be out of their holes and closing in to get at you (if not they've lost the game). It's also handy to have that re-roll on the first attempt, so they have a relatively good chance at ranging in on the first attempt (albeit not as good a chance as the rockets do). In this Fighting Withdrawal mission, the SS-Mortars hold the middle objective. 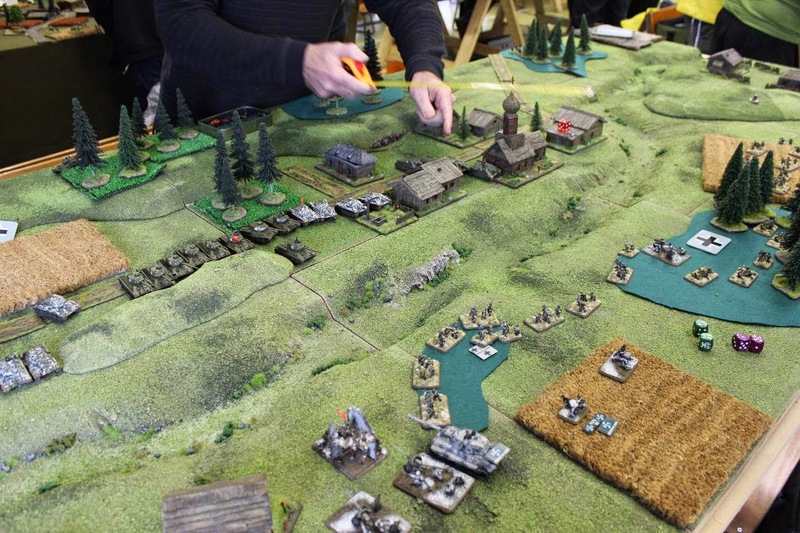 All five teams are placed within 4"of the objective and will hold it with their dying breath, should the enemy make it through the withering fire of a half-dozen PaK40s! Finally, they too have Enjoy the War, and can sit on an objective for a while. Enjoy the War will also preserve your VPs. I usually place them on an objective I expect the enemy to have to take by shooting rather than assault, increasing their ability to hold on and forcing your opponent to have to dedicate shooting resources to dealing with them. 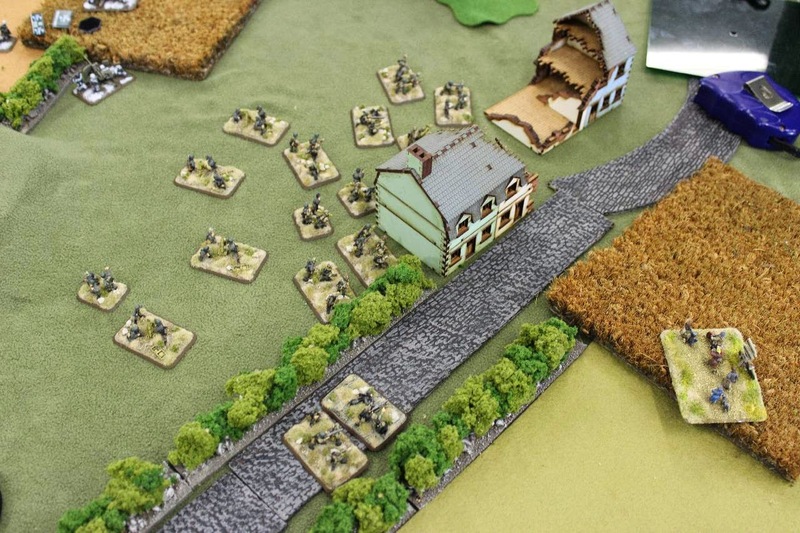 With the other platoons holding the mortars' flanks, the enemy will have to reduce at least two platoons that are enjoying the hell out of the war! The best speed bump you could add is one or two Volkssturm platoons. Plop these in front of your Westfalen to buy you a turn. They won't hold out for more that a turn, but they will force your opponent to either shoot at them and take the heat off your platoons that Enjoy the War (further guaranteeing that they'll still be holding objectives at the end of the game), or assault them, where your troops can hopefully lend some defensive fire and cause some casualties. When building your list, your points will go faster than you realize, so make sure that you're buying what you need, and maximize on the Enjoy The War platoons (remember that your SS-Panzers get it too!). With what's left over I would invest in some light AA to keep the enemy planes at bay, and add firepower to incoming infantry. From there, the Volks artillery was a nice addition to our list and I would recommend considering the full 6-gun FK40 (PaK40) battery if you have the points. It's a big platoon and difficult to break with a staff team added into the mix. At some point, your Westfalen will actually have to attack, whether its because of a fair fight mission, or you've come up against another always defends or fortification company. You should be prepared for this eventuality and take it in stride. 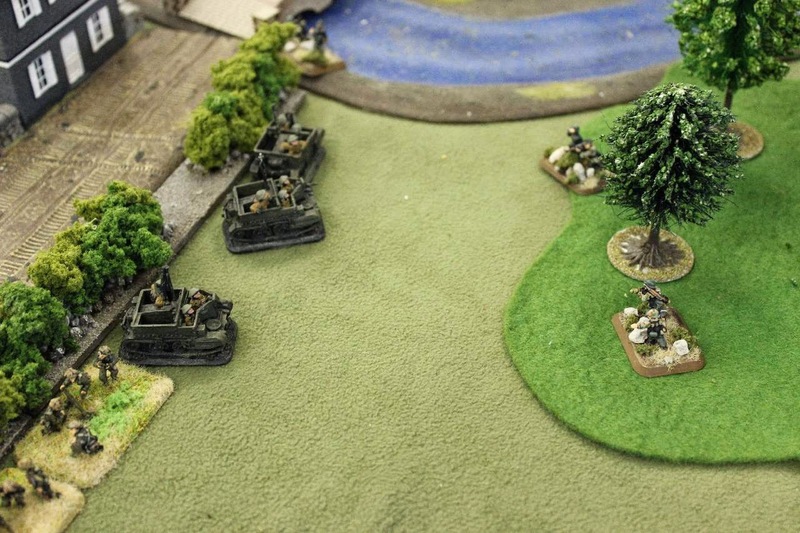 Your offensive tools are your mortars (or Nebs/artillery) and tanks, but you'll need to get in there with your Fearless Trained troops to take the objective. Like with many Trained forces, getting across No-man's-land is a tough order, but you've got one thing other forces haven't: Enjoy the War. If the usual tactics are not an option, like using terrain to cover your advance, this special rule will help you cross killing fields should the worst befall your troops. You still need to closely cover your troops with smoke, machine-gun fire, and mobile assets, like tanks. When you're trained, you need to really rely on a close-knit team to get places. This is where the Panzer IIIs are useful as they will help cover your infantry from enemy HMGs and other infantry threats. Your heavy tanks should be tying up any other assets, such as tanks or long-range artillery. Traps and Snipers are helpful, but lose a lot of their power since they cannot deploy in the enemy deployment areas. Traps can deploy outside and then move in, but snipers are restricted to No-man's-land. There is also a likely chance that the snipers and traps will be rendered useless by the proximity of your assaulting troops, so keep that in mind as well. 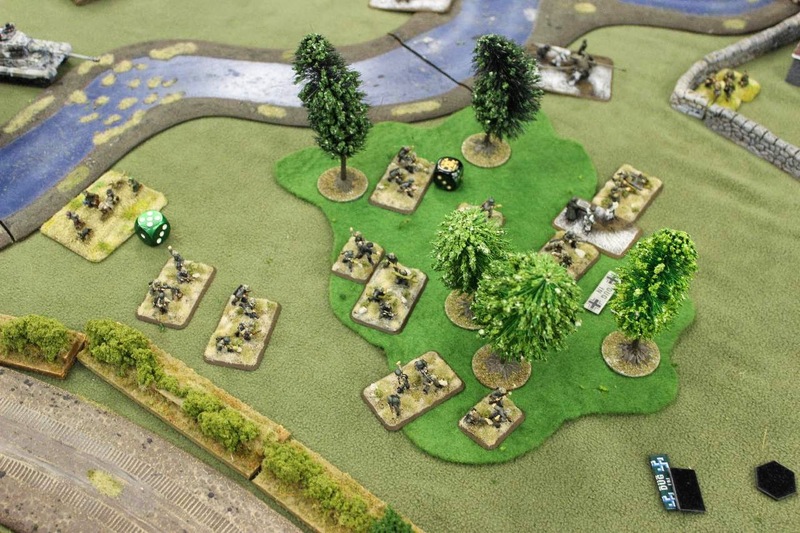 Snipers are best placed at the flanks of your assault to cover your charge and pin down enemy platoons. Their 4+ firepower is good at knocking out gun teams, if they can reach them. The Traps are good for counterattacking counterattackers or just moving into the enemy deployment area on foot and causing general havoc. 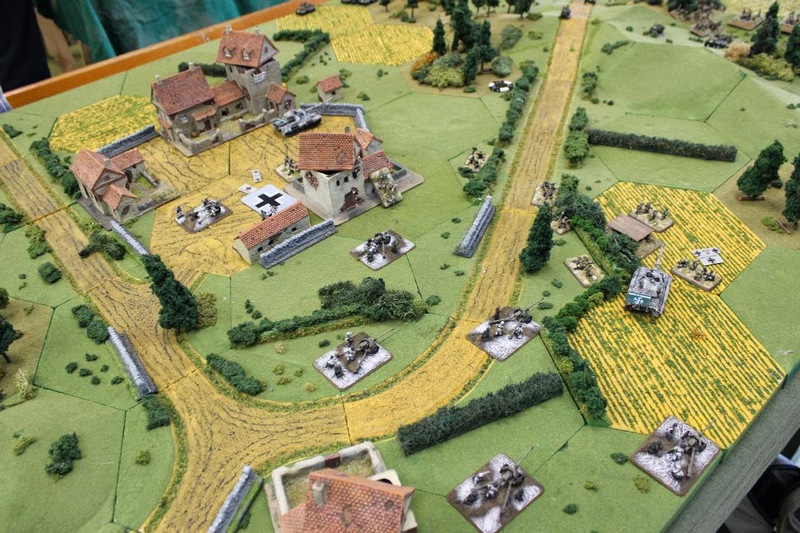 Keep some in reserve to exploit opportunities such as ambushing enemy platoons that move At the Double. Everything you do on the battlefield or add to your army should have the number one goal in mind: DELAY. You're looking to throw the enemy's plans out the window, cause chaos with traps and snipers, and make it impossible to shift your incredibly well-motivated troops. Well, that's about what I've got for tonight. If you have any other tips and or points to add, please drop them below. Good luck! Makes me want to take these guys out for a spin! Great summary Mike. Trap teams and snipers working together can cause all sorts of problems and delays for attackers, and then having to kill off the infantry pretty much to the last man.... it's a lot tougher than it may first appear!